So, I have been really busy lately. It is really hard working full time and being a mom and wife. So blogging isn't very hi up there on the list. Sorry to all of you who love to look at them. 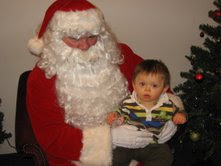 A few weeks ago, Crystal, my cousin, was babysitting Nate and they went to a church party and Nate got to sit on Santa's lap. He didn't really give much reaction to this. For Christmas we were able to go to my parents house for a couple of days. We didn't take real pictures b/c G&G Rice gave us a cam corder for Christmas. Thank you G&G Rice. So right now I need to figure out how to post little video's of Nate. All of my sister's and their families were also at my parents house. There were 21 of us all together! Yes, we all stayed under the same roof for about 3 days. It was fun, but I was glad to get home to some peace and quiet. Although, Nate is quite the chatter box these days. He loves to say 'hi daddy' and 'momma' and a few other words. He is finally showing signs of walking. 13 months and he can take about 6 steps on his own. He gets too excited and then falls over. Charlie and I are doing well. We both enjoy our jobs and the people we work with. Also we are enjoying our ward at church, the people there are so friendly. I will try to get more pictures of Nate up here soon. Merry Christmas and Happy New Year! Let's have a great 2009! When G&G Rice came to visit a month ago, they got Nate this cute church outfit. I made sure to get him some black shoe's to match. We think he is just too cute. He is getting so big, we are going to have to get him a new car seat soon. We are excited for him to be able to face the front so we can see him and he can see us. He does pretty well in the car, but that will be nice to see each other. As you can see, I got my hair cut off, again. I really like it and will have to post some better pictures. Today my hair was really cute, but then I got in the shower with Nate and that went away. This weekend is our EQ party at church on Friday, and then on Sat. is Charlie's work party. So I'll get gussied up and then we can take some good pictures. 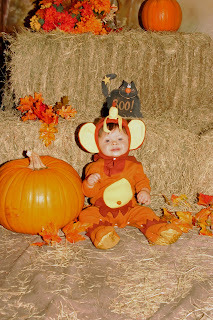 On Saturday we went to our Ward Halloween Party and we dressed Nate up as a monkey. 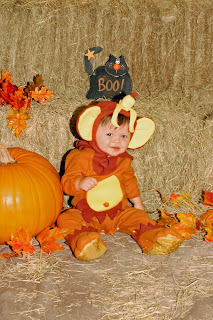 The cutest monkey ever in my book! We had chili and got to show off Nate, it was really fun. We didn't do the trunk or treat b/c we don't need the candy and neither did Nate. So this is him in his monkey costume. We will be going trick or treating with Vicky and her kids on Friday. We are looking forward to that and will keep you posted. What do I say is everywhere....NATE! Now that he is crawling quickly to anything and everything, most of which I don't want him to go to...I am very busy. He is very independent with the direction he wants to go. He'll just take off down the hall and into what ever room he wants. I feel like I get nothing done when I get home because I am too busy chasing Nate. He is pulling himself up to the couch or piano bench, then gets mad when he falls on his bum. It is a fun new stage, but a busy one. This weekend Nate and I decided to go see my parents since Charlie had to work this weekend. We were able to ride on the 4 wheelers and Nate really enjoyed that. Also we think that Nate is finally teething. He is almost 11 months old and still NO teeth. Sometimes I wonder what I can and can't feed him because of this fact. Also he is not sleeping very well at this time,which is not fun when both parents have full time jobs. I just got a calling in our church, I lead the music in Sacrament, and pick the songs. It should be fun. Charlie is the secretary in EQ in case we did not mention that. We are looking forward to our Trunk or treat this year, especially to be able to dress Nate in his costume. We'll keep ya posted, but if it takes a couple of weeks, it is all Nate's fault! Ha ha. Nate is now 10 months old, and cute as ever! He is scooting everywhere and sometime will crawl, but prefers not to. Just this week he has started pulling up on things and gets about half way up and gets stuck, then slumps back down. He still has no teeth, but sure does have an appetite. Our only problem is that he seems to think that he doesn't need to drink much liquids. If anyone has a way of getting kids to drink, out of a bottle or a sippy cup, please let us know. The other day we went in to check on Nate in his crib and this is what we found. He is just so funny. He has also started to make a "sour" face that is really cute. I'll have to try to get that on camera sometime. Lately we have been able to spend lots of time with family. Vicky and Jordan went to a baptism the other night so we babysat Spencer, Dallin, and Trista. Vicky's kids just love Nate and for the most part Nate loves them. Sometimes they play with him too hard for too long and Nate lets me know that he is tired of playing with them. Nate was playing with his blocks the other night when the kids came over and Dallin said, "Uncle Chuck, why does Nate Nate eat the blocks?" Uncle Chuck responded with, "until about 2 years ago, you just ate the blocks too." Dallin thought that to be interesting. On Saturday Aunt Becca came over with cousin Jacob and Nate was kind enough to share his new toy that his G&G Rice sent for him. Thank you G&G Rice! Nate received a rather large package on our front door step the other day and it was the cutest thing...a catapillar that is a rocking horse type thing. It is so cute. So we put Nate on it and then Jacob behind it and they thought that was fun. I like the picture where Nate is looking back at Jacob, very cute. Nate is not big enough to play on it by himself, but he likes Mommy or Daddy to help him rock on it. Lately Nate has really loved to play with Tangent. Tangent is so good and patient with Nate. Tangent lets Nate pull his tail, play with his ears and slap his head. Tangent is good at laying next to Nate as close as possible with out sitting on him. It is so cute. About 2 nights ago, Nate rolled over and slept on his tummy all night...so maybe there is hope that he won't have a flat head his whole life! I took a picture of Charlie and Nate after Nate got up that morning with his hair all messed up. It is so cute. Nate has decided to roll over and crawl backwards. I don't know why he doesn't go forward, but at least he's moving now.